Arnold Will Be Back!! 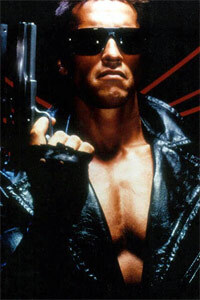 Terminator 5 Is Getting Ready! We all know why TERMINATOR SALVATION was bad. It definitely was not the wanna-be Transformer robot things or the bad dialogue or the contrived story or the direction. It was most certainly the lack of Arnold Schwarzenegger. And Pacificor, the studio who bought the rights to the film just over a year ago is giving us just that. As of right now the only man officially on the project along with Arnold is producer Robert Cort. This means absolutely nothing to me. I am usually annoyed more than anything by producers. DYLAN DOG has absolutely no relation to TERMINATOR SALVATION. So why do you have to tell me that the two movies were produced by the same people. If nothing else DYLAN DOG is getting even more of a bad rap because of it. The internet buzz has it that Justin Lin will be directing the next entry in the franchise which is funny that this news comes out now since the man has a pretty big movie hitting theaters this Friday. Gotta love Hollywood. People time big announcements just perfectly. Now, I don’t think you are going to rush out to see FAST FIVE cause it’s directed by the same guy who might helm the next TERMINATOR film. But no press is bad press, right? What do you think of this whole scenario? Is Arnold too old for the part?